If you have a passion for ranch management, well then this is the book for you. I’m talking livestock production, breeding programs, animal health, management principles with a side of romance and a nefarious drug lord. Griffin Reese is an up and coming defense lawyer from Dallas. Her business partner and lover, Christine, begins taking legal cases for drug kingpin and all hell breaks loose. On the run from the man who aims to kill her before she can testify in federal court, Griffin hides out on her grandfather’s cattle ranch in the panhandle of Texas. Teal Giovanni was a US senator’s right-hand woman and her lover too. The problem is the senator happens to be married, while the senor’s husband is understanding of her extramarital affairs, her constituents are not. When the press catches wind of Washington’s juiciest headline, Teal is cast aside while her boss plays innocent. She tucks her tail between her legs and heads for her cousin’s ranch in New Mexico. Her car gives out, and she is stranded in Texas and guess who rescues her, you got it, Griffin. Where books with similar premises thrive (ex. Carsen Taite’s latest, Without Justice), this one does not. 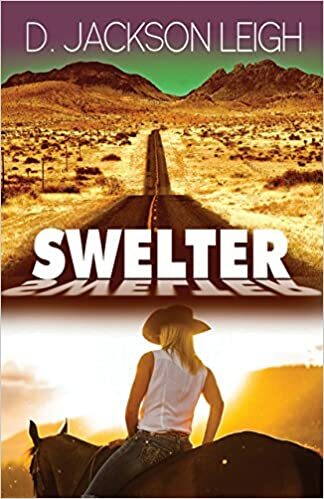 Swelter is not a long book by any means but it feels like you just read forever. There are too many details about inconsequential subjects, which become distracting, and quite frankly boring as hell. Paragraphs about castrating cattle just don’t make my heart swoon, but hey maybe it’s just me. The setting should add to a story, not be the story.